Posted on February 7, 2007	by Linda S.
PC in the shop for a full day and night… DH told me I was like a little kid watching someone else eat as he sat at his pc…lol But, we’re back now… software for the most part reloaded and good to go… we hope. I have already acquired another unknown user on my user list (with it’s own icon, I might add, and also password protected)… that we are hoping is a Microsoft thing. It’s being checked on as we speak and I should hear some more about it in a bit. Enough about that…. I have finished the feather stitching on the quilt top. The leaves will be added using a lighter color green. I thought since I am already threaded up with the dark green, I will put a signature and date in the lower left hand block, then feather stitch around it. This lone block was not exactly planned for the signature piece, but it surely did work out nice… a happy accident. This entry was posted in Embroidery, Handcraft, Handwork, Needlework, Quilt, Sewing. Bookmark the permalink. It’s beautiful, I think the featherstitch is making more of a design plus than handstitching would. 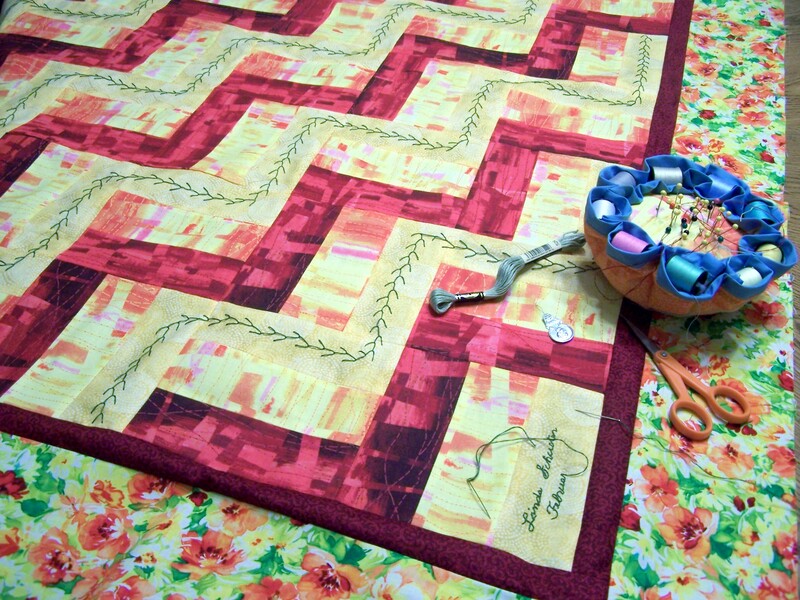 I’m not so great at handquilting either!